At Vitamin World, even when our store locations are closed, we’re here to help. For Website Questions or feedback, please Email Us. 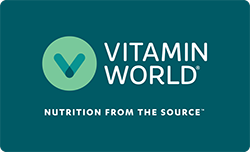 If you would like your brand and/or products to be available at Vitamin World, please email us at ProductSubmission@vitaminworld.com with all product information in order to be considered.